Two researchers at the University of Arizona have an innovative idea for how to raise research funding at a time when federal research dollars are shrinking: the two graduate students in Anna Dornhaus’ social-insect lab have turned to crowd-funding and social media. The method of raising money for research is so new that administrators at the University of Arizona aren’t prepared to deal with it. Faculty and staff will have to wait to follow the graduate students’ lead until the university can figure out a way to defray the “indirect costs” of supervising research. “It’s frustrating to have these questions that are so interesting and to be held back by something so trivial as money,” said graduate researcher Nicole Fischer. For Fischer and Sarah Bengston, the two graduate researchers in the social-insect lab, the small amount of funding they endeavor to raise will be used to buy a computer processor that’s able to analyze recorded ant behavior. According to the Arizona Daily Star, they also hope to pay for time using some of the University of Arizona’s best microscopes to examine ant brains. Fischer and Bengston turned to social media to raise funds because research money is dwindling while competition is increasing. “These kinds of small grants are so critical. A lot of us faculty remember when we got a couple thousand dollars to pursue something that we’re still working on,” said University of Arizona Vice President for Research Jennifer Barton. “We’re rapidly figuring out how to best incorporate crowd funding into our mix of funding sources,” she wrote in an email. In addition to thinking about alternative means of raising research funding, the University of Arizona receives a great deal of funding from the NIH and NSF. In 2012, the NIH awarded the University of Arizona $83.3 million in research funding, while the NSF awarded the university $51.5 million that same year. For a full list of departments and projects receiving NIH and NSF funding at the University of Arizona, please visit the NIH website and the NSF website. If you are a lab supplier interested in marketing your life science products and working to sell lab equipment at Arizona life science marketing events, Biotechnology Calendar, Inc. invites you to network with others in your field and exhibit at our annual Tucson BioResearch Product Faire™ Event on October 9th, 2013. 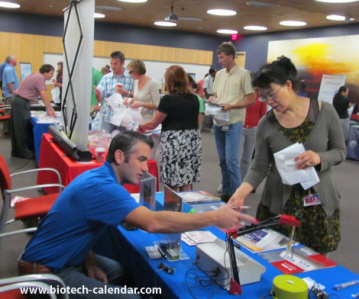 Last year’s Tucson BioResearch Product Faire™ Event attracted 151 attendees, of which 25 were purchasing agents, professors and post docs, and 25 were lab managers. The visitors came from 23 different research buildings and 41 departments around campus. Biotechnology Calendar, Inc. is a full-service science research marketing and events-planning company that has been organizing life science marketing events at top research universities across the country for the past 20 years. If you’re interested in working to sell lab equipment and market life science products at life science marketing events closer to home, we encourage you to view our 2013 calendar of events. For more detailed funding statistics on the University of Arizona, or to learn more about the Tucson BioResearch Product Faire™ Event, click on the button below.